In last week’s Photo of the Week blog post, I featured a teenager photographing flowers. I told her parents how inspiring it was to see a young person so interested in photography, something far beyond selfies. When the young woman joined the conversation, I gave her some advice. I told her to look around when everyone else is looking at the obvious and showed her an example of what I meant. She and her parents thanked me, and we parted ways. “Looking Up” is an example of taking my own advice, something I too often fail to do. Just ask my patient wife. 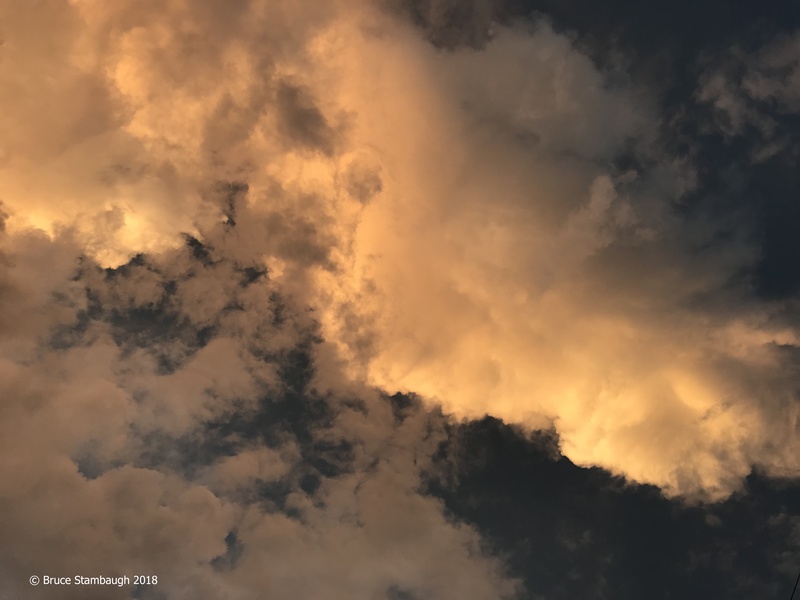 While recently photographing a sunset after the passage of some summer thunderstorms, I was ready to leave when I happened to look overhead. This is what I saw, the remaining rays of the day highlighting some roiling cumulonimbus clouds. I couldn’t believe all of the beauty that was right above me while I waited on a spectacular sunset that didn’t materialize. As I told the young photographer, look all around you. You just might find something spectacular to capture and share. “Looking Up” is my Photo of the Week. The clouds such as you show here have been so fantastic this summer, unusually so, probably because of more rain than normal. Indeed, Melodie. The views of the storm clouds have been incredible, especially after the pass to the east and the sun illuminates them.